When creating a virtual machine from an image using the resource manger GUI, Azure walks you through every setting. Users pick the type of storage, the network settings, etc. In addition to this, most templates ask the customer to pick a username and a password. The username and password I chose did not work in the GUI leaving me very confused. I entered a username of my choosing and a password of my choosing and I couldn't connect to the web UI. Note: This article uses the SoftNAS Developer Edition, though I suspect it's true of other editions as well. The username I selected us "adminuser." It might not be special, but it works well enough in a POC. I then selected my password. I open a browser window, enter the public IP, and get a login dialog. But then, the credentials don't work. After some digging (ie reading the manual), I discovered that the expected username was "softnas." I tried the username "softnas" along with the password I crated and still was denied access. The workaround I found was to login via an SSH session. I used the username and password created with the template to connect successfully. There are number of default users. A list of them can be found via "more /etc/passwd"
The softnas user exists by default. The password for the softnas account can be set issuing the command "sudo passwd softnas"
At this point, the softnas username can be used to login to the web interface. 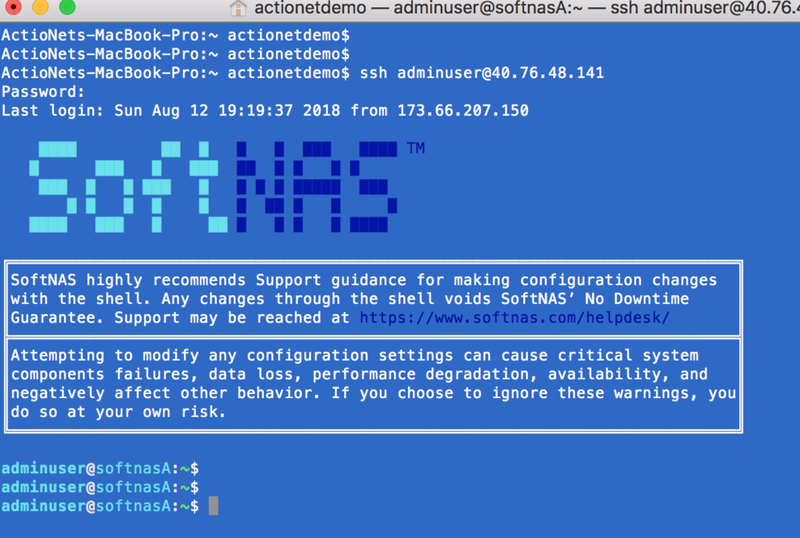 The SoftNAS appliance is a linux vm, so traditional linux commands (like passwd) work. The fix is to set the username as "softnas" from the very beginning.